Listen to any written text from wherever you are on any device. ReadSpeaker TextAid lets you listen to an audio version of any written text using the latest high-quality text-to-speech technology. You can also choose to have the text highlighted while it is being read, which is proven to improve comprehension. ReadSpeaker TextAid can be used anywhere on any device as long as you have a web browser and an internet connection. Language and speed – Listen to text in English, German, Spanish, French, Italian, Dutch, Norwegian, Finnish, or Swedish and adjust the reading speed to your comfort level. Text Highlighting – Have the text highlighted as it is being read. You can choose the colors used for the text and the sentence/word highlighting. Text Settings – Customize the text display and formatting for more comfortable reading. You can choose the text color, size, and typeface, including special fonts that improve readability for those with dyslexia. Translation – Translate your pasted text into any of the available languages. You can then listen to the translation or revert back to the original language. Copy any text you want to listen to. Click the Listen button to listen to the text. At any time, you can change the settings to customize the display and reading of the pasted text. Listen to any text from any location, on any device, at any time, without anything to download or install. Improve your understanding of the text by listening to it and having it highlighted at the same time. Enhance the readability and accessibility of any text by customizing text display, formatting, reading, and highlighting according to your preferences. Make learning a foreign language easier when you can check both the translation and pronunciation of foreign words and phrases. * Bimodal presentation refers to information that is presented in both audio and visual formats at the same time. 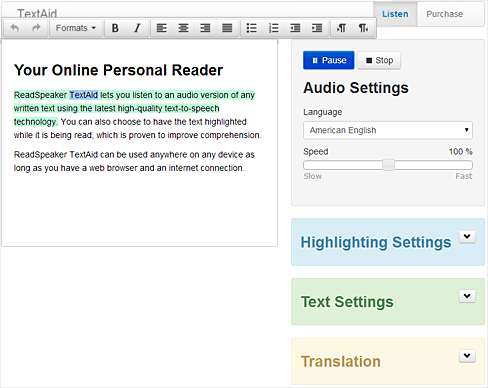 Bimodal reading refers to the act of reading text while hearing the words at the same time, such as when using speech synthesis software, or reading the text, hearing the words, and having the words (and/or sentences) highlighted at the same time, such as when using text-to-speech software with integrated highlighting.